You boys like Mexico? 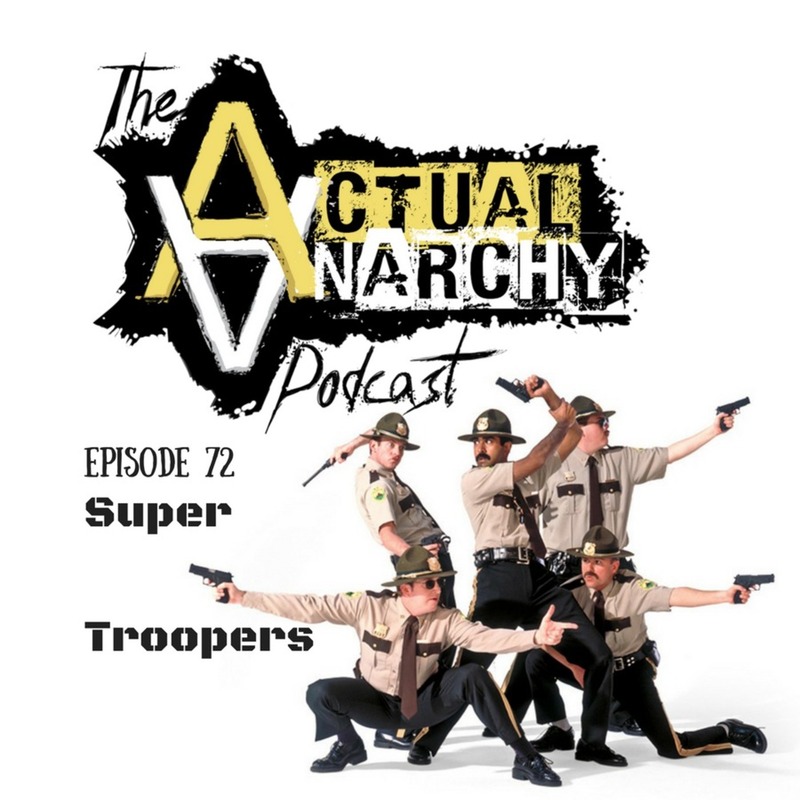 As the sequel is about to hit theaters, we revist an old classic (that hasn't aged well), Super Troopers. Five Vermont state troopers, avid pranksters with a knack for screwing up, try to save their jobs and out-do the local police department by solving a crime. Super Troopers is a 2001 American crime-comedy film directed by Jay Chandrasekhar, written by and starring the Broken Lizard comedy group (Jay Chandrasekhar, Kevin Heffernan, Steve Lemme, Paul Soter and Erik Stolhanske). Marisa Coughlan, Daniel von Bargen and Brian Cox co-star while Lynda Carter has a cameo appearance. We hope you enjoy this episode that takes a fairly dark turn and mixes in a few quotable lines. Don't call me Radio. Show notes: http://www.actualanarchy.com/72 Thank you for joining us on this episode of the Actual Anarchy Podcast! The Actual Anarchy Podcast is all about Maximum Freedom. Robert and I analyze popular movies from a Rothbardian/Anarcho-Capitalist perspective. If it's voluntary, we're cool with it. If it's not, then it violated the Non-Aggression Principle and Property Rights - the core tenants of Libertarian Theory - and hence - human freedom. We use movies as a starting point for people who may not be familiar with this way of thinking. Discussion of the plot and decisions that characters make in relation to morality and violations of the non-aggression principle are our bread and butter. We also will highlight and discuss any themes or lessons from Austrian Economics that we can glean from the film. The point is to show what anarchy actually is with instances that are presented in film. We publish new episodes on Sunday just in time for your Monday commute; and occasionally will do specials surrounding holidays or events (elections/olympics). Hit us up on our Tip Jar page to see all the myriad was you can support the show and the site: www.actualanarchy.com/tipjar Also, be sure to give us your likes, comments, shares, ratings, reviews, and other feedbacks! Never miss an episode. Subscribe on Apple Podcasts to get new episodes as they become available.